Wolfpak Decals has their end of year 'Thank You' sheet that is available while they last for a purchase of $30 or more. This one has four interesting subjects on it in 1/72 scale, and one of them is a first for me. First up is a 35 TFW boss bird F-4G from 1982. The plane is in standard SEA camouflage and judging by the yellow fin tip, was maintained by the 561st TFS. Next, an MQ-1 Predator from the 178 RS, North Dakota ANG. 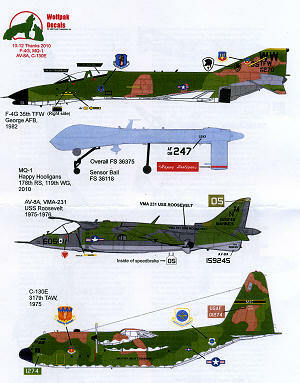 Like several ANG units who have traded in F-16s or KC-135s, they are now relegated to oversize remote control planes. Effective, yes, but not the sort of 'flying' that I think justifies spending millions on pilot training. Anyway, it is the first set of aftermarket markings I've seen for one of these. The AV-8A is fromVMA-231 aboard the USS Franklin D. Roosevelt in 1975/76 during one of the FDR's last if not the last cruise. Today, Harriers routinely deploy on Gator Freighters, and like this aircraft, will take on the codes of the deployed Helo wing. Finally, a nicely done SEA camouflage C-130E from the 317 TAW during 1975. This is about as colorful as a standard USAF C-130 will get and it is nice to have this option. 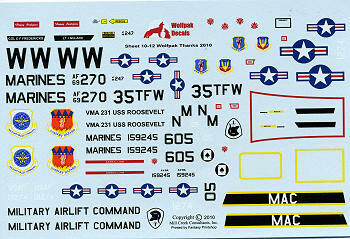 Thanks to WolfPak Decals for the review sample. Again, this sheet is only available while quantities last and only with a $30 minimum order.